I was so excited to go to church last Wednesday to help teach AWANA. There was a little postcard sitting in my mail box. It was an invitation to a game & party night. YES!! Girls night out. I NEVER get that as a single mom!!! I can't afford the babysitter. I decided I didn't care about getting a babysitter this time, I just needed to hang with the ladies. I had no idea what to expect because I didn't know what games they were going to play, and lets be honest here...I'm kind of a freak about winning when it comes to games. Being a God-fearing Christian woman flies out the window when I'm playin' games! God luv ya. So I show up and the first thing they ask me as I walk through the door is, "Where's your sling?" Oops, I hadn't worn it all day and forgot it at home. Don't tell my surgeon, ok? Oh, and did I mention there were appetizers we were all to bring? I brought pineapple & apples with fruit dip. Getting together wherever there's food is always a big draw for me. We finally get settled in to watch a movie and it turns out we're watching a woman called Anita Renfroe. Our church had just had a women's night out and they watched one of her videos. Lucky me, I got to work. NOT! I was in tears this woman was so stinkin' funny. She speaks to what women deal with on a daily basis: how we think; what we feel about ourselves, husbands, friends, kids, etc; how we look and so much more. After we've laughed for about 45+ min she shares something about the Lord. She reminds us of how precious we are. Then she jumps back into her wackiness. The part of her show that brings out her creative side are her reworded songs. She changes the words to songs such as Ricky Martin's "La vida Loca", Josh Grobin's "You Raise Me Up", and the "William Tell Overture". Those are just a few examples. 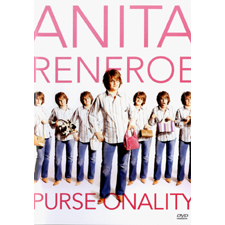 We watched the DVD "Purse-onality". There were guys in the audience where it was filmed laughing as hard as the women! I think my favorite song was the "Venti Mocha Song" or the "Coffee" one. She is hysterical. If you can get to a Women of Faith conference, she might be there! You can find her on Facebook where she has a video of her Mammogram skit, which is truly hysterical, because it's sooo true. She also has her Mom video there as well.